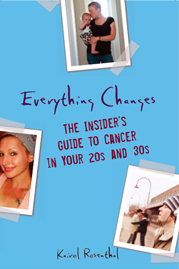 Everything Changes – The Guide to Young Adult Cancer » Has Poetry Helped? A great part of being an author and blogger is all of the emails I get from readers who I never would have met otherwise. Rich Devlin is one of those people. Rich sent me a riveting poem a few weeks ago called The Price of Survivorship, which you can read below. He recently lost his wife of 38 years to breast cancer, and lost both of his parents to cancer too. He has two young daughters for whom he is “scared to death.” I’m curious to hear your response to his poem. Have you ever written poetry during your or someone else’s illness? Do you have any favorite poetry or poets that you read to get you through the rough times? 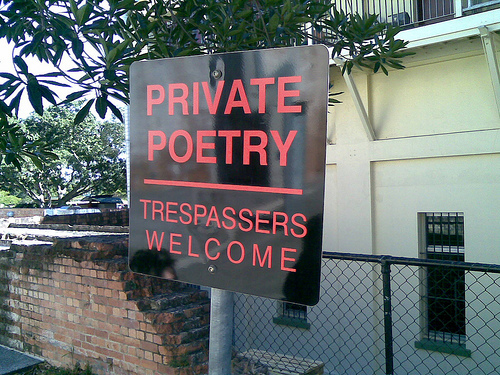 If you have any favorite poems, written by you or another poet, please leave them in the comment section for me and others to read. Come on Luke, I know YOU do! I’m not sure about poetry specifically in my case, but I definitely have found writing in general to be cathartic. Anybody else think the same? Rich’s poem about the ‘price’ hit me in the gut. Which is what powerful poetry is supposed to do. Well-done, Rich. I’ve always been a writer, and like Frank, writing about my cancer (which is why I started blogging at the end of 2004) has been cathartic. And there’s been poetry, too. five minutes, just for me. be any place in the world but here. before Casey brings me the tennis ball. without Xeloda or Kytril or radiation. and the snooze button–my time. but 6:00 a.m. to 6:05 a.m. are all mine. just a youthful blemish or two. There is no sign of what lies beneath the skin. Blue eyes washed in sea green. I’ve seen all my life. layered with her flesh and bone. Her image becomes a watery blur. I ask, mirror, mirror on the wall. to puddle on my feet. begins the list of flaws. in front of the reflecting glass. It is difficult to look. I see spots, scars, a need for sit-ups. I am a weathered female child. the dark brow accenting them from birth. You want my honest opinion on cancer poetry, and all other cancer art, really? I think creating it can be very therapeutic for the creator. It can be extraordinarily healing to get these feelings out on paper or canvas or whatever. That said, such poetry and art is quite honestly not usually very good. It’s generally of the very self-absorbed type, which is understandable, considering, but it tends to come off as rather adolescent. I don’t mean to offend anyone, because as I said, I do believe in the therapeutic value of the creative process, but most “cancer art” just doesn’t do it for me as art or poetry in its own right. That said, I find real comfort and solace in reading other poetry – reminds me of the beauty in the world, the depths of the human mind, and the truths that art can uncover. I really appreciate anonymous’ comment just posted above about the quality of therapeutic art. In most ways I agree. This is why the 12 journals I wrote in for cathartic purposes during treatment are on my closet shelf instead of on the Barnes and Noble shelf. As a writer (and formerly in my choreography) I try to use a sharp editorial eye in distinguishing what is personal venting and what is worth sharing with an audience. Sometimes I shape and mold personal vents into something that is meant for others to see. In the end, I always ask does this serve just me or does it serve an audience? There is a ton of my creative life that I keep private. I said I agree with this in most circumstances, because I think of all the art work I have seen born out of suffering, which has effectively rocked my world: Bill T. Jones’ exquisite choreography about his lover dying of AIDS, William Kentridge’s gorgeous films about Apartheid in South Africa, and Sharon Olds’ raw poetry about domestic violence. I also think that in forums, like this blog, it can be really useful to share writing that was therapeutic for the creator, because chances are it might also touch another person who is currently facing the same issues. Think Rich, Pat, and Carolyn’s poems are pretty damn amazing and I welcome more of them. I say Bring ‘em on! Written when my wife was diagnosed with breast cancer in 2001..She’s now an eight year survivor. Ethel Freeman’s body sat for days in her wheelchair outside the New Orleans Convention Center. Her son Herbert, who had assured his mother that help was on the way, was forced to leave her there once she died. gon’ bide my time, fanning against this sun. I ask my boy, and all he says is Wait. He wipes my brow with steam, says I should sleep. I trust his every word. Herbert my son. I believe him when he says help gon’ come. making us hear engines, wheels. Not yet. Wait. is it coming? Such a strong man, my son. Can’t help but believe when he tells us, Wait. Wait some more. Wish some trees would block this sun. you gon’ miss it. Look there, I tell my son. wait for the salvation that’s sho to come. I see my savior’s face ‘longside that sun. Nobody sees me running toward the sun. Lawd, they think I done gone and fell asleep. Ain’t but one power make me leave my son. I can’t wait, Herbert. Lawd knows I can’t wait. Don’t cry, boy, I ain’t in that chair no more. seen that ol’ sweet sun lift me out of sleep. Didn’t have to wait. And see my golden chair? While I agree that there are many poems, stories, movies and cultural elements (tv commentary anyone?) that doesn’t merit the capital “A” of Art…I find two ways that poetry has helped my survival process. One is to read great poets (Eliot, Li-Young Lee, Kenyon, Hall, Rilke, Basho) and remember that wrestling with the everyday and its juncture with mortality is part of our human/diving duality and searching. The other is to write poems. To work them if they merit it into something more than a personal experience of cancer. And even, as all artists do, share something before its time or without regard to someone else’s judgment of artistic merit. So here’s one of those poems to share. as I slid into the farthest lane. In the waiting room, a worried couple. and a blessing where jealousy used to reign. their hats and their evening naps. what daily tasks remain to be accomplished. And I could have missed them completely—I nearly did. for the key. I won’t tell you these things. in the way that counts. But you know, don’t you? in an “O” of startlement and wonder. parking space, listening. Singing along. Damn Laura. I love it. Laura, I agree – your poems have a knack for hitting me right in the gut, as good poetry about the divine ordinary should! I give over to it.